Windows 7 Start Button Creator is a free portable tool that allows you to create a Windows 7 start orb/button with ease. Click on the image near Default Orb. Browse for the image that you want to use as the default orb state. Click on the image near Hover Orb. Browse for the image that you want to use as the hover orb state. Click on the image near Pressed Orb. 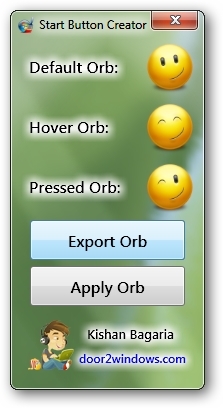 Browse for the image that you want to use as the pressed orb state. Click Export Orb and type the file name of the orb.